Yesterday we wrote about part of Mitt Romney's problem with conservatives- they simply don't like him nearly as much as they do any of the other top Republican candidates for President. Today we're going to tackle the other part of Romney's- and any other Republican perceived to be a moderate's- problem with conservatives. They're likely to make up a much larger share of primary voters in 2012 than they did in 2008. Over the last six weeks we've polled folks who identify themselves as likely Republican voters in six states that also had an exit poll for their Republican primaries in 2008. Comparing the numbers by ideology on our recent polls with what they were for the last election makes it clear that a Republican electorate already dominated by conservatives has become even more so over the last few years. -2008 exit polls showed that conservatives accounted for anywhere from 56 to 68% of the primary voters in these states. Our polls for 2012 find that range to be from 70% to 77%. The percentage of likely primary voters self identifying as conservatives is up at least 7% in every individual state, and that increase goes as high as 16% in the case of Wisconsin. -Liberals have become completely extinct in the Republican Party. This may seem obvious but 9% of primary voters in these six states still identified themselves as liberals even in 2008. That figure is all the way down to 2.5% on these polls. Whatever liberals remained in the GOP as recently as three years ago have left the ranch now. -On average the percentage of GOP primary voters identifying themselves as conservatives in these states in 2008 was 63%. Now it's 73%. And not surprisingly in addition to the decline of liberals as an influential force in the GOP moderates are on the way down too- from an average of 29% of the primary electorate in 2008 to now 24%. Huckabee is fully aware of how he does with Conservatives. And unlike Palin, he can beat Obama. Btw, Huck also does much better with moderates than Palin. Huckabee believes in man made Climate Change. That should end his chances with the insane flat earther "conservatives" that make up the base of the GOP. Huckabee is a social issues conservative but not on other conservative issues. He is too regional and a one-trick pony. Mittens can't win because of a whole lotta problems. If Palin proves herself in the primary, she'll be the nominee. And, if the economy is till bad and we are still bogged down in Afghanistan, she'll defeat Obama because she'll pick up IN, OH, VA, NC, FL and one of the following: WI, IA, NH, CO, NV, NM. That's it. Obama is vulnerable, and no amount of the media dishing up phony polls like the recent ABC and NBC ones can hide the fact that Palin will sell well in the battleground states where the polling really matters. We have an electoral system, therefore, Obama is in a weak position if he does not move to the middle. My guess is that he continues to stay way left using the Executive branch. An example is Net Neutrality. By getting the foot in the door, the FCC is laying the groundwork for further restrictions on free speech down the road. This will anger Independent voters who want a free and open internet. In 2008 McCain was able to win with 1/3 of the vote (the moderates/liberals) as the conservatives were split between Huckabee and Romney. In 2012 Romney could win as a moderate with 25% of moderates/liberals with the conservatives split 3 ways between Gingrich, Palin and Huckabee. Romney can win by sweeping New England and the NE and the West where he has links, even if he is trounced in the Rustbelt and South. 2008 was an unusual year for Republicans. Some conservatives stayed home due to their disgust with congressional Republicans and their dislike of John McCain. "Obama is vulnerable, and no amount of the media dishing up phony polls like the recent ABC and NBC ones can hide the fact that Palin will sell well in the battleground states where the polling really matters." You're posting on PPP's blog. We have been releasing state-by-state polling showing Palin very weak against Obama in key states, in case you somehow missed it and were directed here by a pro-Palin blog. "An example is Net Neutrality. By getting the foot in the door, the FCC is laying the groundwork for further restrictions on free speech down the road. This will anger Independent voters who want a free and open internet." Net neutrality is the preservation of free speech by its definition. You have apparently been brainwashed by Orwellian right-wing blogs into believing otherwise. The nomination will go to Palin. Huckabee isn't running. Even if he was, he's not a Conservative. I predict she will win the General as well. Why hasn't the second part of the Wisconsin data been posted on line yet? I agree Palin is the likely nominee. I don't understand this statement about her being helped in the general if "we are still bogged down in Afghanistan." First of all, they've already announced "bogging down" through 2014. Second, Palin is for EVEN FURTHER "bogging down" adventures in Iran and God knows where else. She is a superhawk dripping with blood from her ti ... talons. "Why hasn't the second part of the Wisconsin data been posted on line yet?" What second part? We posted numbers for president, Senate, and the GOP primary for president and Senate. I hope there are a lot more Republicans who are as delusional sapwolf. Palin is down by 14% in Florida and North Carolina according to the new PPP polls. Losing either of those states would doom her and she's down by 14 points in both! And it's not because Obama is popular, it's because Sarah Palin is extremely unpopular. And I just really can't imagine a comeback for her. Sane people have made up their minds on Sarah Palin: She is clearly not intelligent enough to be President. Dustin Engall says…..Net Neutrality is the preservation of free speech by its definition. You have apparently been brainwashed by Orwellian right-wing blogs into believing otherwise. Dustin? You have no clue here do you? I am the CEO of one of this nations largest ISP's. The name Net Neutrality by its very description took you for a chump. This bill hands all internet control to the ILECS (Verizon, AT&T), the Cable Companies and Google, yes Google. Now please don’t try to decipher an issue that is obviously way above your pay grade, got it Mumbles? Thank you and Merry Christmas. If you consider regulating free speech then you are spot on. It boils down to those in congress and the WH who feel the need to REGULATE the internet. It's not broke, there is nothing to fix. Sadly, the free market internet is working just fine without massive govt oversight. Well you can kiss that goodbye. Save your time with polling this issue, majority of American's oppose this. Those of us in the flyover states are doing our best to educate ourselves on issues, just wish we could figure out how the leftist can brainwash, but its referred to as fact. By second part of Wisconsin, I'm talking about the GOP candidate matchups against Obama. All the other polls lately have both how they run against each other in a primary, and how they match up against Obama. In the case of Wisconsin, I don't see the matchup data against Obama. I've looked again, and still don't see it. Can you help direct me please? Thanks! I found the Wisconsin data. Sorry for your trouble sir. There is NOT a CONservative on the horizon that can beat our wonderful president!!!!! The CEO of one of the nation's largest ISPs, right! Also with doctorates in rocket science, brain surgery, and automotive repair, no doubt, but somehow unable to figure out how to create a Google account to post under, or provide any verification of a silly Internet boast like that. And, for that matter, unaware that Net Neutrality is hardly a left-only goal; hyper-conservative right-wing blog RedState joined forces with none other than Daily Kos to support the neutral network before. The GOP Electorate needs to nominate a candidate as far opposite of Obama, as is reasonably possible. The clear difference will spell "Victory," come the presidential election. Those candidates who agree with Obama on certain issues, such as man-made global warming, stand a lesser chance of beating him out in the general election. Nathan, I hope the GOP primary voters take your advice. 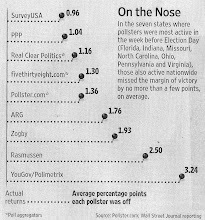 It would surely make our polls now look conservative in estimating Obama's victory margins in each state. Exactly Nathan Bickel! You guys don't need no "RINOs" like Mitt Romney or Mike Huckabee! You need a "REAL CONSERVATIVE" like Sarah Palin !!! She don't believe in no science or no book learnin'!